F/Pinned: http://www.pinterest.com/pin/547680004660090886/shared on FB- Gorgeous, Lynn! Thank you, David and Carol!! amazing colors and very peaceful image! 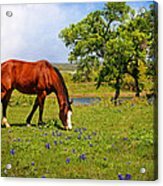 Texas hill country wild flowers and a beautiful equine - lovely. Thanks so much, Debra and Dave! 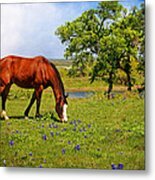 BLUEBONNET TRAIL DELIGHT by Lynn Bauer was taken on a beautiful spring day while driving the Bluebonnet Trail in Ennis, TX. The Bluebonnet Trail is about 40 miles of marked trails that map out the best scenery in the area, with the best bluebonnet blooms. 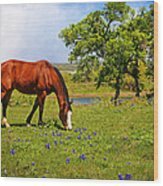 There is a group that changes the route on a weekly basis, as people drive for miles and miles to see the beautiful wildflowers in this area, which is just south of Dallas. 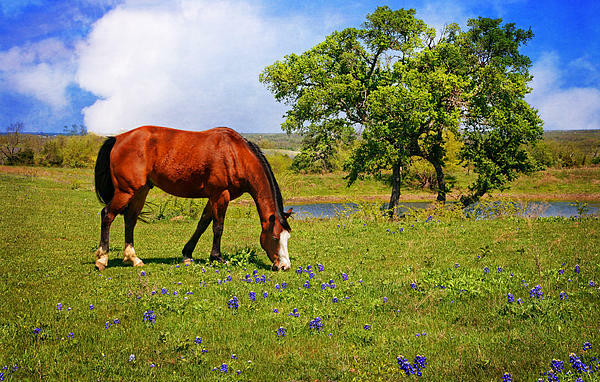 Seeing the horses, cows, and other animals enjoying the spring grasses and flowers just adds to the beauty of the area and makes it a truly delightful experience!